Tomatoes grown on the balcony? And why not! 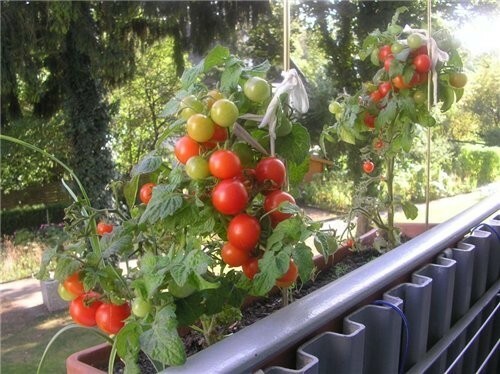 Just select the appropriate varieties – early ripening, forming a small compact Bush – installed on the balcony containers, fill them with soil for vegetable crops and begin planting a vegetable garden on the balcony. Of course this short review does not exhaust the abundance of early varieties of tomatoes for balconies and home gardens. This ultra early variety of tomato for compacted landings. Great for growing in container culture in the loggias, the balconies, in the home. The plant is neat, compact, up to half a meter, does not require the formation and pinching. Fruiting friendly, comes after 80-90 days after germination. Fruit medium-sized, plum, weighing about 60 g. Fruiting occurs together, the harvest is plentiful. The purpose of the class — universal. This ripening varieties can be grown as a container on balconies, loggias, terraces, as well as be used outdoors in tight crop of vegetable and flower crops (in the borders). The plant is a dwarf, ornamental in appearance, 25-30 cm tall. Tomatoes can be grown nonseedlings way. Fruiting bushes are plentiful. The fruits are small, weighing about 25 g, red, very sweet. The purpose of the class — universal. This early maturing variety for cultivation anywhere, and under the film shelters and outdoors, at home, and on loggias and balconies. Plant height of 30-40 cm, does not require the formation and pinching. The variety is characterized by abundant fructification; tomatoes ripen red, small (15-25 g), pleasant sweet taste with the sourness. The grade features high decorative, easy environment, good ability to bear fruit even with a lack of light.